It’s beginning to look a lot like the holiday season in Hampton Roads! Check out this family-friendly holiday events list we’ve compiled to discover where to find the holiday fun near you! The Mavericks: Sleigh Bells Ring Out! Wednesday, December 7, 2016 from 8:00 PM until 10:00 PM. Highlights: From their earliest shows as a garage band playing the punk clubs on Miami Beach, The Mavericks have had a skill for getting people to groove. Drawing on a mix of classic country, cow-punk and standards, The Mavericks have made a career of bringing their rhythmic fervor to audiences throughout the world. Saturday, December 3, 2016 from 12:00 PM until 5:00 PM. Located at the Virginia Beach Convention Center at 1000 19th Street, Virginia Beach, VA 23451. Highlights: Celebrate the Holidays with friends and Virginia wine as Virginia Beach Convention Center is magically transformed into a Winter Wonderland just in time for the Holidays. Finish off your Holiday shopping early at Winter Wine Celebration with a great selection of Virginia wines, wine accessories and unique gift items that will make you the gift giving star. More than 20 Virginia wineries are expected to participate in Winter Wine Celebration. Wineries will provide wine samples to celebrants that purchase Tasting Tickets and will have bottles and cases of wine available to sell to guests. Located at the Barry Robinson Theater at 4552 Princess Anne Road, Virginia Beach, VA 23462. Highlights: You’re invited to the Woods for a holiday tea at Uncle Wiggily’s house… only Uncle Wiggily is the last to know! In order to keep you entertained, the old rabbit gentleman will have to get everyone’s help to put on the biggest production the forest has ever seen: Charles Dickens’ “A Christmas Carol”! With enduring themes of love, generosity, and second chances, there’s no better way to celebrate the season than with Uncle Wiggily and his forest friends in CTHR’s beloved adaptation. A charming and original spin on the classic, and great holiday fun for the entire family. Saturday, November 5, 2016 from 9:00 AM until 5:00 PM. Sunday, November 6, 2016 from 10:00 AM until 4:00 PM. Saturday, November 19, 2016 from 9:00 AM until 5:00 PM. Sunday, November 20, 2016 from 10:00 AM until 4:00 PM. Highlights: This annual holiday tradition features over 100 different craft vendors each weekend. Crafters will be selling unique handmade items, everything from stocking stuffers to fine works of art, all at budget-friendly prices. 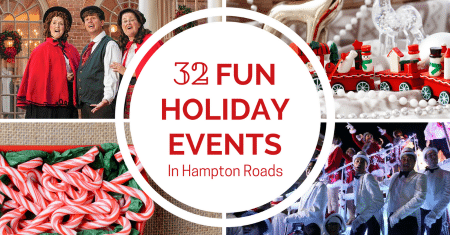 Bring the kids for one of the first opportunities to visit with Santa in Hampton Roads! Thursday, November 24, 2016 from 8:30 AM until 12:00 PM. Located at Sandbridge Market at 205 Sandbridge Road, Virginia Beach, VA 23456. Highlights: This event, held in honor of Charlie and James Normile, will raise money for the Navy SEAL Foundation in memory of those men who lost their lives serving our country. The festive events include a competitive 5K race with prizes, a mile canine crawl/fun run, and a Gobble Wobble (26.2 yards!) for children 6 and younger. Awards will be given for top qualifiers of the 5K. Saturday, December 3, 2016 beginning at 12:00 PM. Highlights: Enjoy an evening of holiday traditions at Town Point Park near the Holiday Homecoming Tree. The park transforms into a festive wonderland to feature a massive Yule Log bonfire, Christmas caroling and a visit from Santa. During the festivities, seasonal craft beer, mulled wine, hot chocolate and other holiday treats will be available for purchase. Bring the family, friends, loved ones, and pets to a fun evening of holiday celebrations and unique traditions. The event is free and open to the public. Saturday, November 26, 2016 from 7:00 PM until 10:00 PM. Located at Chrysler Hall at 215 St. Paul’s Boulevard, Norfolk, VA 23510. Highlights: A true holiday favorite, this beloved comedy classic features renowned composer John Williams’ charming and delightful score performed live to picture by the Virginia Symphony Orchestra with the Governor’s School for the Arts Orchestra. Macaulay Culkin stars as Kevin McCallister, an 8-year-old boy who’s accidentally left behind when his family leaves for Christmas vacation, and who must defend his home against two bungling thieves. Hilarious and heart-warming, Home Alone is holiday fun for the entire family! Saturday, November 19, 2016 beginning at 7:00 PM. Highlights: Don’t miss the 32nd Annual Grand Illumination Parade in Downtown Norfolk. The parade kicks-off with the illumination of the downtown skyline. Then enjoy the premier holiday parade in the region featuring spectacular floats, marching bands, giant balloons, dancers and Santa himself. The theme this year is “Winter Wonderland.” The parade is the kick-off event of Holidays in the City, six-weeks of celebration and holiday events and activities in Norfolk and Olde Towne Portsmouth. Enjoy holiday traditions like the Virginia Stage Company’s A Christmas Carol and visit attractions like Dickens’ Christmas Towne. Saturday, December 3, 2016 from 4:00 PM until 8:00 PM. Located at City Center at Oyster Point Fountain Plaza at 700 Town Center Drive, Newport News, VA 23606. Highlights: Hollydazzle is a “one of a kind” holiday show that combines synchronized fireworks, theatrical lighting, ground-based pyrotechnics and special effects all choreographed to festive music – making it one of the top shows of the year! The show transforms City Center at Oyster Point into a kaleidoscope of color reflecting on the fountains’ five-acre water surface. And because it’s “in-the-round,” the show looks the same no matter what side of the fountain you’re standing on! Hollydazzle also includes the lighting of a 45′ holiday tree on the Fountain Plaza. The tree combines the latest technology in LED light animation to create its own continuous light show. It fades from color to color, shimmers, chases lights, and creates unique patterned effects, and the lights are synchronized with recorded holiday music. More than 30,000 people attend Hollydazzle each year. Enjoy free children’s activities and holiday performances throughout the City Center at Oyster Point area. Saturday, November 26, 2016 and Saturday, December 17, 2016 from 5:30 PM until 7:30 PM both days. Highlights: Experience the journey of the Magi around you in the Virginia Living Museum’s “Star of Wonder: Mystery of the Christmas Star.” Afterwards, get into the holiday spirit with the music of the season and dazzling laser effects! Featuring classic holiday favorites like Burl Ives’ “Rudolph the Red-Nosed Reindeer,” modern hits like Randy Travis’ “Jingle Bell Rock,” and unique reimaginings of timeless songs like Enya’s beautiful “Oiche Chiun (Silent Night),” this delightful program is fun for the whole family. It’s an animated Christmas light display like no other you’ve ever seen! Tuesday, November 29, 2016 from 7:00 PM until 9:30 PM. Highlights: The beloved TV classic “Rudolph the Red-Nosed Reindeer” soars off the screen and onto the stage this holiday season. Come see all of your favorite characters from the special including Santa and Mrs. Claus, Hermey the Elf, Bumble the Abominable Snow Monster, Clarice, Yukon Cornelius and of course, Rudolph, as they come to life in “Rudolph The Red-Nosed Reindeer: The Musical.” It’s an adventure that teaches us that what makes you different can be what makes you special. Don’t miss this wonderful holiday tradition that speaks to the misfit in all of us! Wednesday, November 30, 2016 from 7:30 PM until 10:00 PM. Highlights: Mannheim Steamroller Christmas by Chip Davis has been America’s favorite holiday tradition for the past 30 years. Grammy Award-winner Davis has created a show that features the beloved Christmas music of Mannheim Steamroller along with dazzling multimedia effects. Experience the magic as the spirit of the season comes alive with the signature sound of Mannheim Steamroller. Their holiday CDs have become synonymous with Christmas and continue to occupy top spots on Billboard’s seasonal charts. Located at Peninsula Town Center at 4410 E. Claiborne Square, Hampton, VA 23666. Highlights: Join Santa in town square in front of the Christmas Tree for holiday photos with jolly old elf himself. Bring your own device to capture the special memory. Saturday, November 19, 2016 from 9:30 AM until 11:30 AM. Highlights: The parade kicks off at 9:30AM and will proceed down Coliseum Drive from Hampton Roads Center Parkway, turn into Peninsula Town Center, and will finish on Von Schilling Drive. Pre-parade entertainment will begin at 8:30AM. The parade will feature numerous high school bands, large helium balloons, inflatable walking characters, animals, floats and of course, Santa Claus! Wednesday, December 14, 2016 from 7:00 PM until 9:00 PM. Doors open at 6:00 PM. Located at the Chesapeake Conference Center at 900 Greenbrier Circle, Chesapeake, VA 23320. Saturday, November 19, 2016 from 10:00 AM until 5:00 PM and Sunday, November 20, 2016 from 11:00 AM until 4:00 PM. Highlights: Get your holiday shopping started early. Talented artisans display and sell their crafts at this traditional opening of the holiday shopping season in Chesapeake. Over 90 crafters to shop from for handmade gifts and decorations! Santa Claus will make an appearance from 1:00 PM until 3:00 PM both days. The Santa House is in the Kroger Market Parking lot for the children to come see Santa, Mrs. Claus and all the elves, to receive candy, gifts and smiles through Love, Hope and Joy. Portsmouth Kroger Marketplace Parking Lot. Saturday, December 10, 2016 from 12:00 PM until 6:00 PM. Located in Olde Towne Portsmouth at 200 High Street, Portsmouth, VA 23704. Highlights: Join the Olde Towne businesses and museums for holiday music and carols. Launched in 1998, this festival has become one of Portsmouth’s signature holiday season events. It is a musical tribute to the spirt of the Holiday Season, enlivening the historic High Street corridor with performances, children’s activities, re-enactors in period attire and strolling characters. Highlights: Celebrate the season with Winter Wonderland at the Portsmouth Art & Cultural Center, a holiday classic for generations of Hampton Roads visitors and residents. This event includes scenes from the famed Coleman Collection. From Victorian scenes of animated skaters and carolers, to the enchanted forest of bears, deer and Santa’s workshop, the displays are sure to delight visitors of all ages! Also enjoy an array of holiday activities including crafts, face-painting, tasty treats, performances including plays, music and song, and horse-drawn carriage rides! The Winter Wonderland event runs from November 25, 2016 until December 31, 2016. Saturday, November 26, 2016 from 5:00 PM until 8:00 PM. Highlights: Bring the whole family to this festive holiday event. The kids will love visiting Santa while choral groups, storytellers and other live entertainment will get everyone in the holiday spirit! Enjoy a visit with Santa, free hot pretzels (while they last) with other goodies, live holiday music, storytelling, and face painting! On select days and times from November 25, 2016 until January 2, 2016. Saturday, December 3, 2016 beginning at 8:00 AM. Sunday, December 4, 2016 from 8:00 AM until 11:00 AM. Highlights: Make this the one tradition you don’t miss – Family, Fitness, and Fun! Enjoy the sights, smells, and sounds of Christmas as you wind your way through the world’s most beautiful theme park in this exciting 8k run through the wonderfully decorated Christmas Town in Busch Gardens! Sunday, December 4, 2016 from 5:00 PM until 7:30PM. Highlights: Join Colonial Williamsburg for this special day by strolling the Revolutionary City and viewing all the unique decorations! Enjoy musical performances from multiple stages and delight in the fireworks displays from three different locations. Fireworks begin at 7:00 PM. Fireworks displays from three different locations within the Historic Area: the Capitol, Magazine, and Palace. Make this a highlight of the Colonial Williamsburg holiday season! Saturday, December 3, 2016 from 10:00 AM until 5:00 PM. Highlights: Kick off your holiday shopping with handcrafted gifts at the 4th Annual Artisan Gift Fair at the Suffolk Visitor Center’s open-air Pavilion. Enjoy festive music, light refreshments and arts and crafts! Saturday, December 10, 2016 beginning at 7:00 PM. Highlights: This year’s theme is “Holidays in Toyland.” Find the best spot to watch the floats, equestrian units, marching bands and festive vehicles stroll down West Washington Street and take a turn up North Main Street, with the parade route ending on Finney Avenue. This year’s grandstand will be in front of the SunTrust building on Main Street. Friday, December 2, 2016 from 7:00 PM until 8:00 PM. Saturday, December 3, 2016 from 10:00 AM until 3:00 PM. Saturday, December 3, 2016 from 6:00 PM until 8:00 PM. Sunday, December 4, 2016 from 1:00 PM until 4:00 PM. Located at York Hall in Historic Yorktown at 301 Main Street, Yorktown, VA 23690. Highlights: Christmas is alive at York Hall where children and parents can visit with Santa Claus, enjoy some tasty treats, and shop for holiday gifts in the Gallery at York Hall! Saturday, December 10, 2016 from 8:30 AM until 10:30 AM. Located at Riverwalk Landing’s Riverwalk Restaurant at 323 Water Street, Yorktown, VA 23690. Highlights: Join Santa and Mrs. Claus, special guests from the North Pole, for a kid-friendly breakfast. Experience the enchantment on the children’s faces as they relay their Christmas wish list to Santa. Special treats for the kids! Saturday, December 10, 2016 from 9:00 AM until 3:00 PM.